I have a lot of plans for how to polish up KDE software 2019 and I’m super excited to get started with no distractions! Wow, congratulations on the new job ! That’s great news ! Thank you, I’m super excited! Congratulations, Nate. I’m so happy for you. You deserve it. Congratulations ! Go rock them ! And its also great news for the kde project. Enjoy your time working on the project you are passionate about. Congratulations. Blue Systems did the right thing! Thank You for the report and Your work. there are some really nice fixes here! How is the Global Menu related to the Application Menu that you can put in the title bar in the Windows Decorations settings? I don’t use Global Menu, but I heard that GTK windows respects the Global Menu, but I don’t see the Application Menu appearing on GTK windows. KDE respects the Application Menu fine (though it’s horribly broken on Wayland). The Application Menu window decorations will only be visible for windows that ask KWin to draw the window decorations. GTK apps that implement client-side decorations (e.g. headerbars) do not, to KWin doesn’t draw the shadow or the titlebar, which means it won’t have a titlebar that has the Application Menu button in it. All of this is GTK’s fault, but I’m hoping we can do *something* on our end to improve the user experience anyway, which is pretty bad right now for people who want or need to use GTK headerbar apps. Out of curiosity, what model does GNOME use that lets CSD work but clashes with KDE at large? There should be blogs by developers talking about it, I’ll Google for them. According the comments on the script’s page, it seems to need to be coded and enabled on an app-by-app basis, so it won’t work as a permanent solution. And lastly, I think you misunderstood the Application Menu I’m referring to. I’m talking about the traditional menus that the move to CSD abandoned. I’ve recently found it’s working on LibreOffice, but not so much in Firefox or GIMP, which is very weird. Congratulations!!! I’m Very happy about you!!! You deserve it! When, for example, trying to upload or open a file, I can only do so for local files. I just can’t browse thru any network from the “open dialog”. Which component to blame for this? What’s the problem? Is it windows or plasma? Is there a bug report on this for one to follow (didn’t find anything…)? What app are you trying to upload files to? 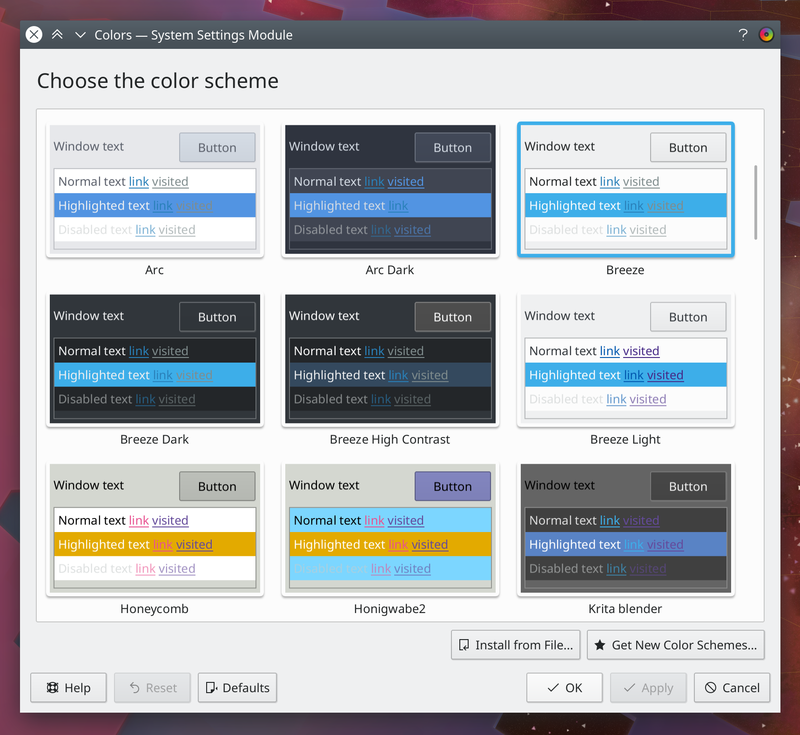 Firefox or another GTK app? Or a KDE app? Usually Firefox, but I also tried Falkon. Firefox uses the GTK file dialog, so that would not be a KDE problem. Can you share a screenshot of the dialog on Falkon? Only at work, probably Tuesday or Wednesday. As i mentioned before Firefox is, indeed, using Qt’s open dialog (as you can see from the screenshot). As you can see, on the left panel (places) there is no network link. Even setting the path manually does not work – this is veeeery annoying to work with……. What does your Dolphin Places Panel look like? What about the Places Panel on the right side on Gwenview’s home screen? Thanks. This is two separate bugs, one for Falkon, and another for xdg-desktop-portal-kde. For both, the problem is that they are not exposing KIO’s remote access features in the file dialog. Can you file those bugs? I’ll try, but before i do it, I want to clarify it as i don’t believe it’s just Falkon. Calligra and Krita, for example, are not showing it either. Are these included in xdg-desktop-portal-kde? Okay, if those don’t show it either, then it’s most likely a user configuration issue rather than a bug. Are those sections hidden? If you right-click on a header in the places panel, is there an option to un-hide stuff? Does it reproduce in a new user account? At this point you should proceed to an appropriate user forum of some sort. Congrats on the new job, Nate. It’s awesome that you’ll be able to do what you love full time and not worry about making ends meet. Yes, I am truly blessed. Sometimes I wonder what in the world I did to deserve this, when so many others don’t have these opportunities. Congratulations! Finally, your work and passion are recognized :). You deserve it! What is the reason for the desktop toolbox? One of the first things I do on a vanilla Plasma install is to disable desktop toolbox. All its features are accessible by more intuitive means. Desktop toolbox is just awkward and confusing part and has no real benefit, only cons. @John, I opened a kde-dialog window and there is no way to access network resources from there. Maybe there is no such option yet? I didn’t notice it before. Or maybe I’m missing something too? I’m having an old, Manjaro KDE install so, for the most part, my desktop is fully featured and I don’t miss much. I just never needed to access network files in kde-dialog box. From older topic: MPT Android connection still seems to be massively broken or unstable. I thought there were working on this and had first ideas how to fix it or did I understand it wrong and it’s still under development and not ready yet? I’m on Plasma 15.4.5, KDE Framework 5.54.0, Qt 5.12.0, kernel 4.20.5. Trying access or do any operation on files and folders on Android is so massive pain that it’s on borderline not being usable at all. I barely managed to delete and upload some files/folders but the process broke in the middle anyway so, in the end, I still didn’t get what I wanted. It doesn’t work well through KDE-connect, it doesn’t work well (or at all) through usb-cable… I have even impression that it worked better in the past but now got broken even more. I start to think I need to install nautilus for this. If you’re still having trouble with MTP in KDE Applications 18.12.0, I’m sorry to hear that. The rewrite seemed to solve a lot of problems, but I guess not all of them. Please file bugs in the kio-extras product. I try to open mounted Android in Dolphin and I get an error. I check the phone and mpt is enabled but I do it again, it restarts mount, I click on it again and it errors out again and so on. I can do it 25 times and nothing but then suddenly it starts working in 26th time… There is no logic or consistency to it. This was the case before but usually, I could get it working in a few attempts, not a few dozen attempts as it is now. And as before, if it starts working, it drops in the middle of transfer after a few minutes. This is simply not suitable for bug report. Maybe I have to find a way to see some journal logs of what is happening or anything pointing to the issue? Anyway, let’s leave it for now, maybe something substantial come later. I don’t want to spoil the happiness by complaining. I’ll manage somehow. There are apps to transfer files with a help of browser or something. This is simply not suitable for bug report. Sure it is! 🙂 Can’t get fixed if it isn’t reported. Ok, will think about it. I need some bug documentation and more testing. Oh wow! That’s the best news! It’s great to hear that you’re being picked up by Blue Systems. The improvement in quality and consistency of KDE/Plasma has been so very much in time you’ve been heading this project. Long may it continue! Heh, I’d hardly call myself “heading the project”, but I’m glad the work has been appreciated! I’m really happy for you Nate, finally an enterprise recognized all your hard and constant work to improve KDE ecosystem and offered you a job as QA, now you can do the same as you was doing the last complete year, but being your work from now on. Congratulations from the bottom of my heart and i really hope you can be a guide and example to follow to a lot more, of course i know you’ll be doing at least, as good as you were doing until now, if not even better. Plasma 5.15 will be an amazing improve, for what i have been reading all the past recent weeks, but Plasma 5.16 looks great too, as always. Thanks like ever for your amazing and hard work. Thanks so much for those very kind words! It makes me happy to know that the work is useful and appreciated. 🙂 I intend to do even more of it! That’s really nice to read. I really trust in you Nate, i think you gained our trust based on your whole year of visible work, showing us and making KDE software even better, making the development something for anyone interested and with a few minutes to read and investigate. Don’t worry, I definitely plan to! I have a slight annoyance with gwenview, we can choose to have a “sticky” zoom, so that when we go from one image to another the zoom level is unchanged, the problem is that this option comes bundled with “sticky” position, often times I find myself reading images with text on them and if the image is big enough it needs me scrolling down when I go to the next page it will be scrolled down as well, so ill have to scroll up, then scroll down to read and repeat procedure with each subsequent page. So I think that zoom and position should be different settings. Put all images in one zip archive, rename it to .cba or cbz, open in Okular, enjoy! Congratulations! Tremendous news, and well deserved. Can you tell us a bit more about Blue Systems? Thanks@! Congrats on the new job position! I hope there will be continued push for improving KWin, including Wayland support and may be Vulkan renderer backend. There certainly will! Just today an NVIDIA engineer submitted the first patch for proprietary driver support on Wayland. There’s a lot of work ahead of course, but it looks like they’re serious. Other non-NVIDIA Wayland work continues apace too! Best news of the year, Nate, congrats !! Congratulations Nate and what a wonderful news for the KDE project and all its users!! !